When Becky and her fiancée strolled into a shelter to adopt a dog two years ago, they couldn’t help but choose Bobo. He was a nice size for their home, and 1 year old Bobo appeared calm, laid back, and ready to be the newest addition to the family. It only took a few weeks for Becky to fall in love with Bobo, and for Bobo to show his true colors. “He was a runner,” says Becky. Recalling how little by little, Bobo tested his boundaries, escaping further and further away from the home every time a door opened. “He wouldn’t come when he was called and it was getting more dangerous every time he bolted out the door,” remembers Becky. 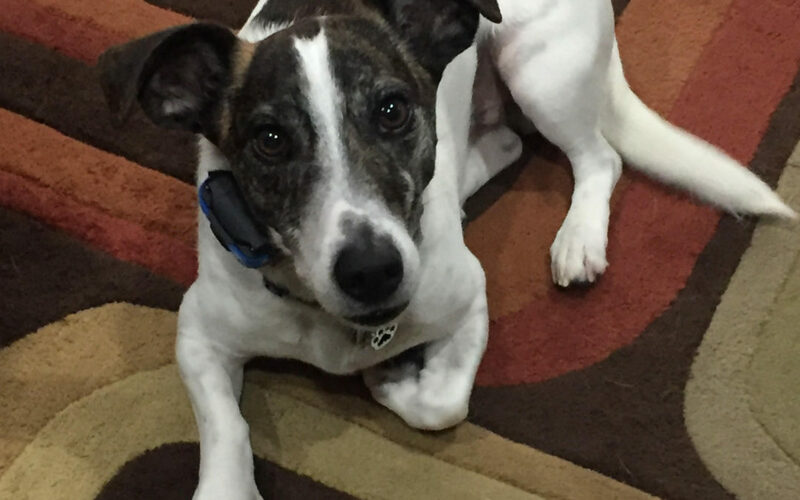 Come to find out, Bobo is a Jack Russell and Whippet mix – the perfect blend of energy and a constant search for the thrill of the hunt. Becky and her fiancée were not equipped to handle these behaviors. As a teacher, Becky thought that she could implement the same strategies for Bobo that she used successfully in the classroom every day. Boundaries were key, but she just couldn’t get Bobo to listen and obey. Walks were miserable as Bobo lunged and pulled at any creature nearby, and visiting Becky’s parents on their farm was stressful as Bobo could become lost at any moment. “I knew that I was ready to invest in a trainer that really worked,” recalls Becky, and she sent out an email to everyone in her school district asking for recommendations. Dog Training Now came highly recommended and she set up a consultation with Marcus to check things out. “Marcus impressed us right away,” says Becky, “but watching one of the dogs he was working with act so well, and so calm, while Bobo was barking and going on – it made the decision easy.” In fact, Marcus even clipped Bobo’s nails during the consultation, which the vet wouldn’t even do without giving Bobo an antianxiety medicine. 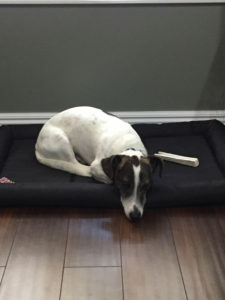 Becky was ready to begin Bobo’s two week training – a mix of boarding and day training based on her family’s schedule. “I was nervous and skeptical that first day,” admits Becky. “But by day 3, Bobo was a new dog. His leash skills and manners were amazing, and with a little practice he was able to obey me and not just the Trainers.” At the conclusion of Bobo’s training, Becky, her fiancée, and the whole extended family noticed the difference immediately. Now, Becky uses the Place command any time a door opens in her home. Bobo happily sits on his spot instead of bolting for the door. They use the Heel command during walks when other dogs pass by, and Bobo obeys to come alongside Becky or her fiancée. 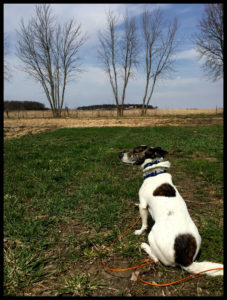 When he’s out on the farm, Bobo returns when called which means he can have a lot more freedom to explore. Well done Bobo! You sailed through training with flying colors and are making your family proud. Want to have an experience like Bobo’s? Give us a call to set up your consultation.